The miniature miConverter 10/100 and miConverter 10/100 Plus are rate-switching 10/100 RJ-45 copper to 100BASE-FX fiber media converters. miConverter provide cost-effective fiber connectivity from Ethernet switches to diagnostic equipment, desktop and laptop computers. They can be powered by a computer’s USB port using the optional USB Power Adaptor Cable, which reduces the module’s weight and eliminates the need to tether the miConverter to an electrical outlet. RJ-45 port supports 10/100 and Half/Full-Duplex auto/ manual negotiation via DIP-switches and MDI/MDIX auto-crossover. The miniature miConverter 10/100 and miConverter 10/100 Plus are rate-switching 10/100 RJ-45 copper to 100BASE-FX fiber media converters. miConverter provide cost-effective fiber connectivity from Ethernet switches to diagnostic equipment, desktop and laptop computers. They can be powered by a computer’s USB port using the optional USB Power Adaptor Cable, which reduces the module’s weight and eliminates the need to tether the miConverter to an electrical outlet. The RJ-45 port can auto-negotiate by detecting the speed and duplex-mode of the connected device. Upon connection to the UTP device, the RJ-45 port speed adjusts to either 10Mbps or 100Mbps, and the duplex-mode adjusts to either Full-Duplex or Half-Duplex. 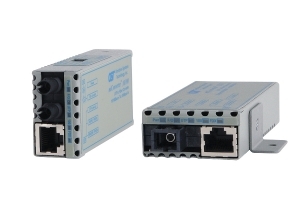 Auto-crossover enables the connection to workstations (MDI port) or hub/switches (MDI-X port) without requiring a crossover cable. The 100BASE-FX fiber port operates in Full-Duplex mode. Models are available for single-mode or multimode fiber with ST or SC fiber connectors. Multimode fiber models support distances up to 5km and single-mode fiber models support distances up to 120km. Single-fiber models support distances up to 60km. Additionally, the miConverter10/100 Plus features DIP-switches for the configuration of the RJ-45 port and Link Modes (fault-detection capabilities). The DIP-switches allow manual configuration of the speed and duplex mode of the copper port, while the Link Modes assist in the identification and isolation of link failures. The available modes are Link Segment, Link Propagate, Remote Fault Detection and Symmetrical Fault Detection. Diagnostic data is provided through LED indicators that assist in network installation and maintenance. The LEDs report the availability of power, port activity and link status, speed and duplex modes of the RJ-45 port. The miConverter 10/100 and miConverter 10/100 Plus can be mounted in the miConverter 18-Module Power Chassis to consolidate individual modules into a rack-mount form factor that can be deployed where multiple fiber optic links are distributed from UTP switch equipment. The chassis powers converter modules with barrel-style DC connectors, and is available with a single universal AC, 24VDC or 48VDC internal power supply. This compact, high-density chassis is 1.5 rack units high, and can be mounted in a standard 19” or 23” equipment rack. The miConverter 10/100 and 10/100 Plus combine reliable Ethernet connectivity with the lightweight design and low-power consumption required for both permanent deployment and mobile service networks. Weighing less than 5 oz. with the USB Power Adapter Cable, the miConverter 10/100 and 10/100 Plus can easily fit into any pocket or laptop carrying case. It can also be attached to portable equipment using the included Velcro® strips or wall-mounted using the optional wall-mounting bracket kit.